Windows 7 comes with a feature that by default will combine multiple windows from the same application into a single stack. For people who run a variety of programs at once this is really useful, but there are times when I find the feature annoying when I want to quickly bounce between a few windows quickly. Let’s adjust this feature and optimize our taskbar space! With the default Windows 7 settings, your windows from the same app will be stacked onto a single icon. Windows will no longer combine unless the Taskbar becomes full. 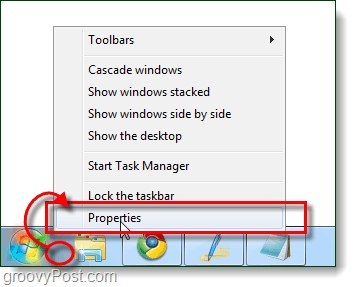 Right-click any empty space on the Taskbar and Select Properties. 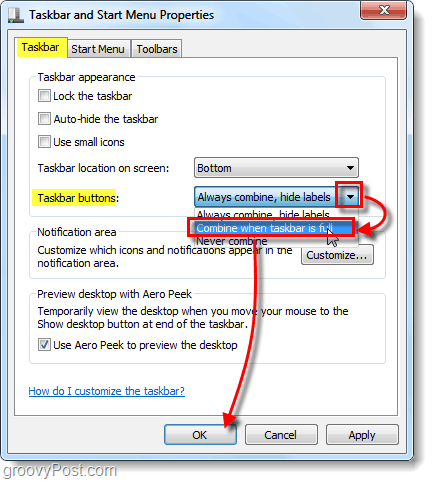 Since we want to optimize our taskbar space, Select Combine when taskbar is full. Now your Windows 7 taskbar will not combine items unless it runs out of room. With this setting you really get the best of both worlds; your entire taskbar space becomes useful, and you don’t have to worry about losing track of your windows if you open too many. Great tip – this is totally necessary, esp. since practically everything I work with is open in a Chrome window. It doesn’t work on my PC. Firefox still wants to open in the middle of my quick launch menu. Very annoying.